According to the building permits database at the Office for Metropolitan History, plans were filed in 1902 with the New York City Dept. of Buildings for the Hotel Woodward to be built at an estimated cost of $400,000 at the southeast corner of Broadway and 55th Street as a 12-story brick and stone hotel. The owner was Nathan E. Clark, 1211 Madison Ave., and the architect was George F. Pelham, 503 5th Ave. The original owner and builder of the Hotel Woodward was Nathan E. Clark (1864/65-1909). He had this notice in the New York Times, 3 April 1909, pg. 9, "Nathan E. Clark, who as a builder and contractor of this city had erected many important buildings, among them the Hotel Woodward, died on Thursday of heart failure at his home, 150 East Ninety-first Street. He was forty-five years old. He leaves a widow and three children." The earliest history of the Woodward is recounted in this story from the Broadway Weekly, Vol. III, No. LXI, New York, 14 April 1904, "A change in the management of the Hotel Woodward, Broadway and Fifty-fifth street, has taken place, R. Graham-Woodward, who superintended the construction of the hotel and after directing the management retiring in favor of T. D. Green, for many years associate manager of the Hotel Jefferson, at Richmond, and proprietor for many seasons of the Princess Anne Hotel, Virginia Beach, Va. The real proprietors of the Hotel Woodward were Lord & Taylor, the dry goods merchants, who relegated to Mr. Titus, of the firm, the trusteeship of the hotel's affairs, all bills being paid by the firm. Nathan Clark, who built the hotel, borrowed $500,000 from the New York Life Insurance Co. He then leased the hotel to Woodward, who, in order to obtain the furniture for the hotel, assigned his lease to Lord & Taylor, and the opinion of lawyers is that in that case the dry goods firm is responsible for the bills of the hotel. Of late, guests of the hotel paid their bills by checks drawn to the order of the Hotel Woodward, such checks being endorsed by Mr. Titus, as trustee. Mr. Woodward for several seasons managed the Hollywood Hotel at Long Branch, and his association with the Hotel Woodward was his debut in the hotel life of the metropolis. The owners of the Hollywood have been making overtures to Woodward to assume again the management of that hotel. He has the offer under consideration." The R. Graham-Woodward referred to above was Robert Graham Woodward, who also used a hyphenated form of his name, Graham-Woodward. A story in the New York Times, 11 August 1903, pg. 10, read in part, "Nathan E. Clark has leased to Robert Graham Woodward, proprietor of the Hollywood Hotel, Long Branch, the twelve-and-a-half-story apartment and transient hotel, to be known as the Woodward Hotel, which is now in course of completion at the southeast corner of Broadway and Fifty-fifth Street." Robert Graham-Woodward, among other things, was an accountant whose business, R. Graham-Woodward & Co. (filing under "G") was listed in New York city directories during the 1900s and 1910s. This story in the Times, 1 October 1910, pg. 4, was only the first featuring the exploits of Mr. Woodward, "Robert Graham Woodward of 605 West 103d Street was before Judge Rosalsky in General Sessions yesterday, and pleaded not guilty to an indictment charging him with grand larceny in the first degree. He was released on $2,000 bail. It is alleged that Woodward represented that he had 25,000 shares of a mine near Georgetown, Col., and that he was connected with the Accord Mining and Milling Company. ... Investigation showed that there was no mill and no rich ore."
A few months later Woodward appeared in this story dated 2 January 1911, "Robert Graham Woodward of 605 West 156th Street, accountant, was arrested at that number yesterday afternoon by Central Office Detective Hunt on the request of Superintendent of Police Sylvester at Washington. He is wanted for larceny. It is alleged that he obtained from A. P. Ordway & Co., 343 West Thirty-seventh Street, manufacturers of bitters, sums of $1,000 and $6,000 by false representations while he was manager of the Ordway plant in 1908. ... Robert A. Kelly, a private detective ... said that Woodward had come from England to San Francisco in 1885, bringing with him a wife and two children, and since then, while holding important places, had been made the subject of continual accusations, of which Kelly gave details. He was in turn an accountant for the Alameda, Piedmont & Oakland Railroad Company and a hotel manager in Hollywood, N.J. In 1904 Kelly said, he took charge of a new hotel at Broadway and Fifty-fifth Street, naming it the Woodward, but failed in business. He then opened an accounting office at 25 Broad Street, where he met Dr. Ordway. According to Kelly, Dr. Ordway, under the influence of Woodward, has spent $6,000 trying to get meerschaum out of a New Mexican mine, and $10,000 trying to get gold out of an abandoned mine in Colorado." Woodward was convicted in the Ordway case, and an account of his appeal in 1912 begins, "The appellant, Robert G. Woodward, alias Robert Graham, alias John Henry Roper, defendant below, was convicted in the supreme court of the District of Columbia of the crime of embezzlement. ... The facts, briefly stated, are that defendant was in the employ of one Ordway, a manufacturer of a certain patent medicine in New York. In May, 1908, Ordway, while in Europe, received a letter from defendant informing him that a letter had been received from the Internal Revenue Bureau, in Washington, requesting him to show cause why the medicine should not be declared a beverage. Defendant, as agent for Ordway, entered into negotiations with the Department, during which he represented to Ordway that it would be necessary to employ one Lamar, a lawyer in Washington, and received $5,000 from Ordway as a fee to be paid to Lamar. The money was sent by carrier from New York, and delivered to defendant in Washington. It developed that Lamar had not been engaged by defendant, and never received the money, - hence, the charge of embezzlement." This ad for the Hollywood Hotel in Long Branch, New Jersey, appeared in the Burr McIntosh Monthly, vol. 1, no. 2, May, 1903. Robert Graham Woodward was proprietor of the Hollywood. This ad for R. Graham-Woodward & Co. appeared in Moody's Magazine, February, 1910. T. D. Green referred to earlier was Thomas Dunbar Green (1870-1954). His life was uneventful in comparison to R. Graham-Woodward, and his obituary appeared in the New York Times, 17 May 1954, reading, "Thomas Dunbar Green, president of the American Hotel Association from 1925 to 1941, died yesterday at his home, 171 West Fifty-seventh Street. He was 83 years old. Mr. Green came to New York in 1903 to manage the Woodward Hotel, which he later purchased and operated until he became executive director of the A.H.A. in 1930. He also had been president and treasurer of the American Hotel Association Directory Corporation, a publication listing hotels throughout the Americas. He was president of the New York State Hotel Association from 1914 to 1921, and four years later was elected to the presidency of the A.H.A., which comprises more than 90 per cent of the hotels in the United States, Canada and Mexico. He held the job of executive director concurrently with the presidency until 1941, when he gave up both. Under the Food Conservation Administration of World War I, Mr. Green was in charge of hotels, restaurants, steamships and dining cars in New York, New Jersey, Pennsylvania and Delaware. For his war work, he was designated a Commander of the Order of the Crown by both Belgium and Italy and Chevalier of the Legion of Honor by France. He was a member of the Metropolitan and Tavern Clubs. Mr. Green is survived by his widow, Julia; a daughter, Mrs. Mackay Sturges of 36 East Thirty-sixth Street; a son, John of Williamsburg, Va.; five grandchildren and five great-grandchildren." Thomas D. Green was born in South Carolina, and this ad from The Bookman, 1907, for the Colonia Hotel in Columbia, South Carolina, mentions that it was managed by Green, who maintained a booking office for the Colonia in the Hotel Woodward, NYC. A story in the New York Times, 20 April 1911, described Green's acquisition of the hotel: "Albert B. Ashforth sold for Lord & Taylor to Thomas D. Green the Hotel Woodward and the Meissonier Apartments adjoining. The hotel is a twelve-story, fireproof hotel, at Broadway and Fifty-fifth Street. It was built in 1904 by Nathan E. Clark, and has been operated by Lord & Taylor, who purchased in 1906 the Meissonier and connected them. The Meissonier is a seven-story building, fronting on both Fifty-fifth Street and Broadway. Mr. Green for the last seven years has managed the Woodward. The property has been held at $1,200,000, exclusive of furniture. Mr. Green has purchased the hotel, furniture and good will." This ad for the Hotel Woodward appeared in the New York Times, 21 May 1911 when T. D. Green was proprietor. Another ad for the Hotel Woodward appeared in the Hotel Red Book, 1920. This also cites T. D. Green as proprietor. Also important in the early years of the Hotel Woodward was Lucius Henry Bingham (1872-1932). His obituary in the New York Times, 23 April 1932, pg. 15, read, "Lucius Henry Bingham, manager of the Hotel Woodward, at Broadway and Fifty-fifth Street, died suddenly of heart disease at his home there on Thursday night in his fifty-ninth year. Mr. Bingham was born in Portland, Me., Dec. 20, 1873 and attended the public schools there. He entered the hotel business in 1890 and was a clerk at the Mount Pleasant Hotel in the White Mountains of New Hampshire and at the Ormond Hotel, Ormond, Fla. Mr. Bingham came to New York City in 1904 as manager of the Hotel Bretton Hall, Broadway and Eighty-sixth Street. He remained there until 1906, when he became manager of the Hotel Woodward, a post he had retained continuously since then. In 1905 Mr. Bingham married Miss Anna P. Knight of Portland, who survives him, as does a son, Lucius Bingham Jr., a student at Princeton. The body will be sent to Portland for burial. Thomas Coad, who had been Mr. Bingham's assistant since 1920, died on Wednesday." This ad from the Automobile Blue Book, 1917, mentions both Thomas Green and Lucius Bingham. The 1930 U. S. Census recorded Lucius H. Bingham living at the Woodward Hotel, 208-210 West 55th Street. He was one among a total of 64 lodgers recorded. In 1936 the Woodward, like many others in the Depression, was sold in foreclosure, and the Bowery Savings Bank bought the property for $1,000,000. A year later the Woodward underwent major renovations. A story in the New York Times, 18 July 1937, RE 1-2, recounted much of the history of the Woodward to that date. "One of the many interesting facts about the Woodward is that, although it was erected as a high-class family hotel more than thirty years ago, the name has never been changed. The architect was Nathan E. Clark whose name is inscribed on a polished stone set in the basement wall at the Broadway corner with the date 1902. The house, however, was not opened until about two or three years later. Perhaps one reason why the hotel retained its original name all these years was due to the fact that its first manager, Thomas D. Green, maintained his proprietorship of the hostelry until 1934. For many years Mr. Green has been president of the Hotel Men's Association and he is one of the best known men in the business throughout the country. In 1926 the Republic of France bestowed upon him the medal of the Legion of Honor. On his retirement he was succeeded by Emil H. Ronay, who had charge of the St. Regis for several years. In addition to being general manager of the Woodward, Mr. Ronay is also manager of the Salisbury Hotel on Fifty-seventh Street and the White Hotel on Lexington Avenue. Carl F. Johnson is the present resident manager of the Woodward. The Lord & Taylor interests acquired the Woodward with the adjoining apartment house in Fifty-fifth Street in 1906 and in 1911 these properties were purchased by Mr. Green, the holding price at the time being given as $1,200,000. The seven-story Fifty-fifth Street building was known as the Meissonier apartment house. It was erected about forty-five years ago and Mr. Green provided entrances from the main hotel to the apartment structure combining them into an enlarged hotel. A few years later he completed his block-front ownership by buying the five-story building on the Seventh Avenue corner, fronting 100 feet on Fifty-fifth Street, from the Edward Clark estate. ... Like almost every other hotel and apartment house in the city, the Woodward did not escape financial difficulties during the depression period, and early. In 1936 the Bowery Savings Bank took over the hotel with the adjoining Fifty-fifth Street buildings, in foreclosure proceedings. The remodeling and redecorating work is being done by the Bowery Bank under the supervision of Harry M. Clawson, architect. In the hotel itself, which contains 200 rooms, the lobby was redecorated in lighter shades, the dining room was redecorated, a new bar was provided at the Broadway entrance, an additional dining room was provided at the left of the lobby, new elevators installed, baths modernized, new plumbing and electric wiring provided and all the rooms redecorated. This work was finished early in the year at a cost of $90,000. ... Early hotel records show that the first guest registered at the Woodward was Peter A. Smith, president of the Wright Lumber Company. Mr. Smith was a bachelor and he died at the Woodward, which had been his home for more than thirty years, on Feb. 12, 1935. ... In the days when the Woodward was practically in the center of Broadway's celebrated 'Automobile Row,' many of the leading motor officials stopped there while in the city, among them being Henry Ford, the late Frederick S. Duesenberg, Captain Eddie V. Rickenbacker, Charles F. Kelly and Harry Horton ..."
The Bowery Savings Bank sold the Hotel Woodward in 1944 to a syndicate of hotel operators. In 1950 this group then sold the lease to a group consisting of Martin Fleischman, Abe Sonenshein and Samuel Spierer. In 1957 the Broadway Woodward Corp. sold it to the Woodward Hotel Corp., Henry Speler, president. 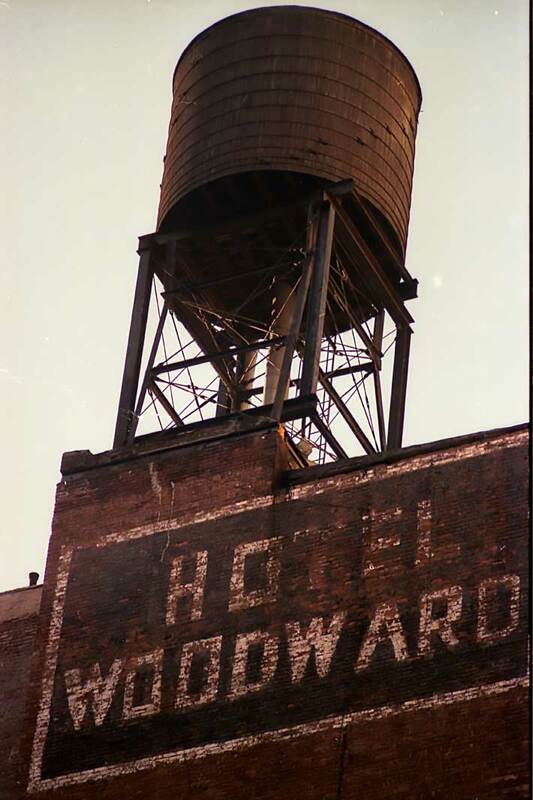 In 2002 the Woodward finally lost its name. It became the Majestic for a time and later the Dream Hotel in 2004. In February 2015 it remains the Dream Hotel. Their website www.dreamhotels.com refers to the hotel as "a restored 1895 Beaux-Arts flatiron building," but this is incorrect. The hotel opened in 1904. And I have no idea what the term "flatiron" is supposed to mean. The Museum of the City of New York has a beautiful postcard view of the Woodward dated ca. 1910. Daytonian in Manhattan has a nice postcard view of the Woodward dated 1930s. Another postcard view (dated 1937) is found at The Daily Postcard.